Just a quick note about this post; there’s going to be a bit of both of us in here, each covering our particular areas of interest (don’t know if you’ve noticed, but my brother tends to do hands-on DIY or how-to-improve game stuff, and my posts are a little more academically orientated. Not always, but as a bit of a general rule). So to keep you on your toes, we’re both writing in this post! So my recent wondering through Assassins Creed IV: Black Flag left me with the crazy longing to be a pirate (my parents did always say I got overly affected by films I saw and games I played). Luckily for me I didn’t have to go to Somalia (like in the South Park episode) I just got out my Pirate of the Caribbean edition of Buccaneer! “Well that’s nothing like being a real Pirate” I hear the voices in my head say! 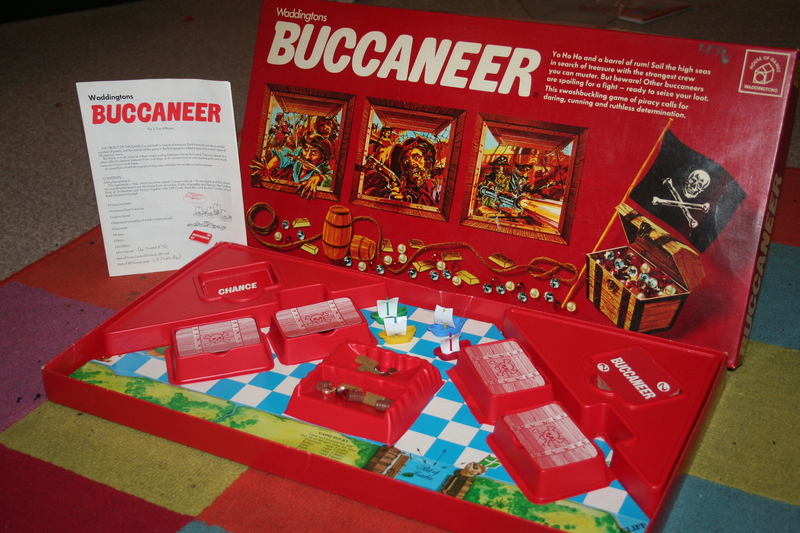 Well, they may have a point but its a damn good game, if a bit different and less explanatory then original Buccaneer! Original Buccaneer. Picture courtesy of our sister/brother-in-law who own the original. Although it’s been around for 75 years, this game doesn’t have a lot of history, in that, it has no historic or cultural background. The original of this game was first published in Britain in 1938, making the game just two decades and four years shy of being 100 years old! It was published by Waddingtons all the way up until the 1980’s, but had several revisions in that time. The original 1938 version of the game had a roll up canvas board that was stored in a tube and this first edition of the game is now incredibly rare, selling for over £100 if complete and in good condition. The game was revised in 1958 and the most notable change is that this version of the game has the folding board that we’re all familiar with now from games like Monopoly and Cluedo. 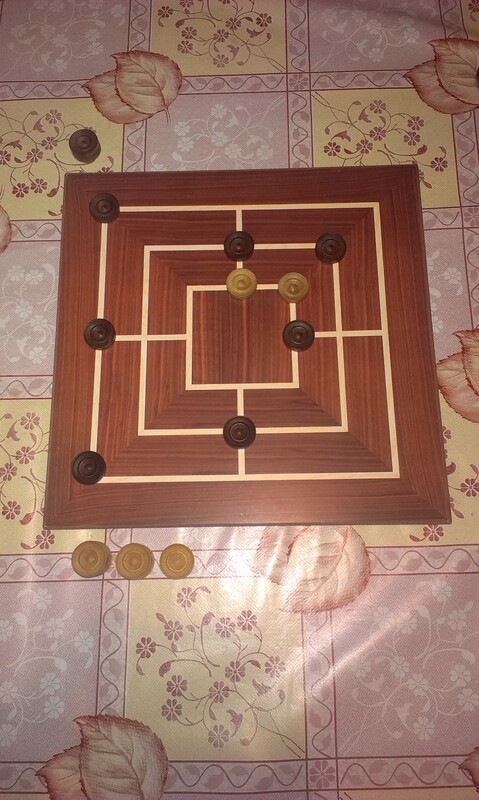 Another change in this edition was that the playing size of the board went from 25×25 to 24×24. There were also the “Small Box” and “Large Box” versions of this edition. 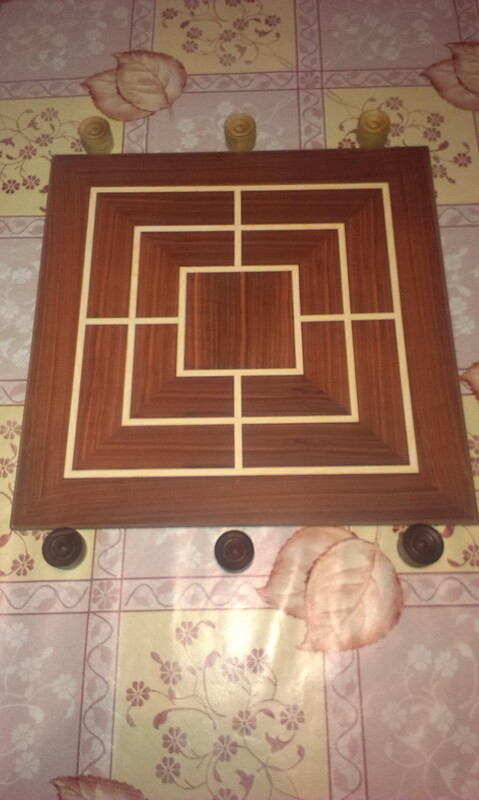 The “Small Box” version was released first, in this version all the pieces for the game were stored in a small box, but the thick, heavy board was separate. 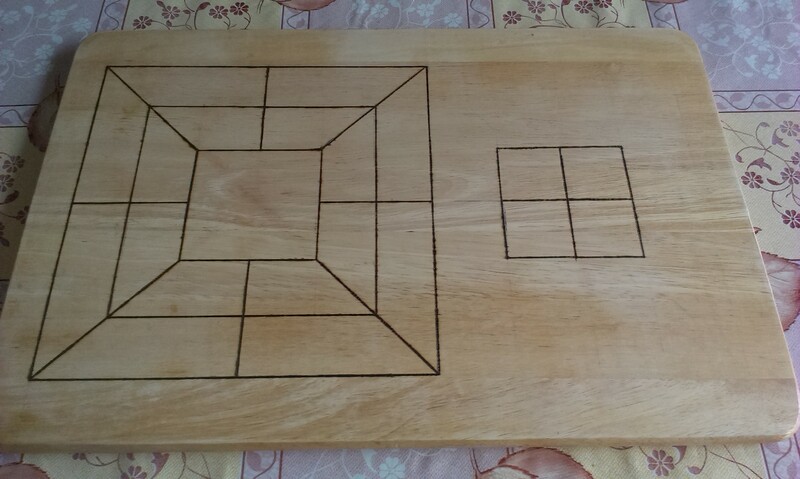 Then there was the “Large Box” edition, you can probably guess where this one’s going, but i’ll put it in anyway, this one had a box large enough to store the board in too. Both the small and large box editions of the game had the same graphics, but with the release of the “Blue Box” version of the game, that changed. 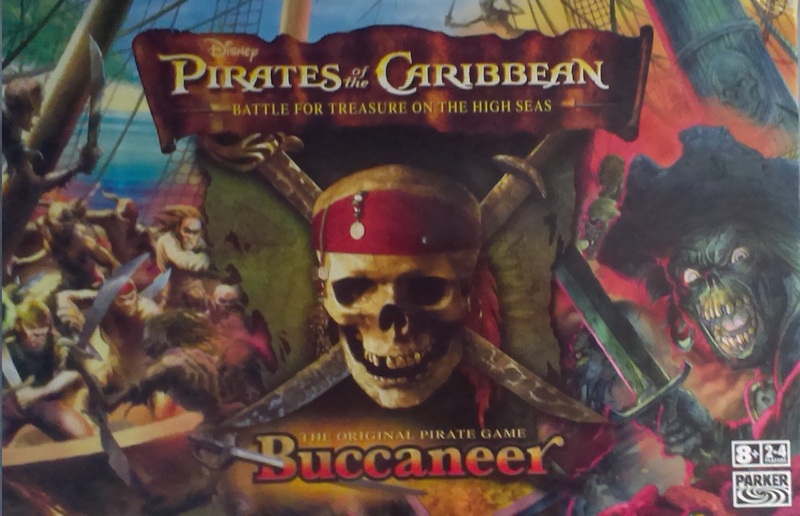 On the box of this version of the game there were some pirates finding a treasure chest, along with the box insert containing “Treasure Island” graphics with palm trees and such. 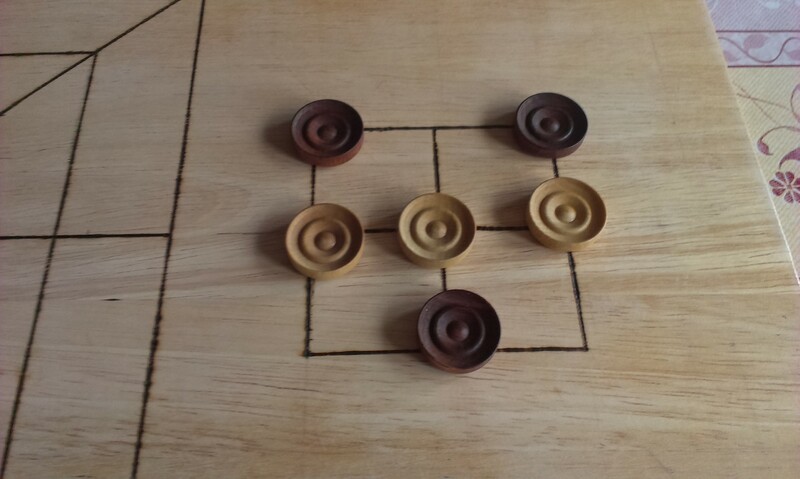 All the biggest changes to the game occurred in the late 1960’s-70’s; the playing size of the board was shrunk again, but this time considerably to 20×20, some ports were reduced or relocated and there was a reduction made to the total amount of treasure available in the game, only five of each type were now included in the game, where previously there were different amounts for the different values of the treasure. Where all the earlier versions of the game were for 6 players, this new edition was only for 4. This was probably the biggest change made to the game. Our copy was released in 2006 to coincide with the Pirates of the Caribbean movies being released. All this exciting info, and very little else, can be found here, for anyone interested! 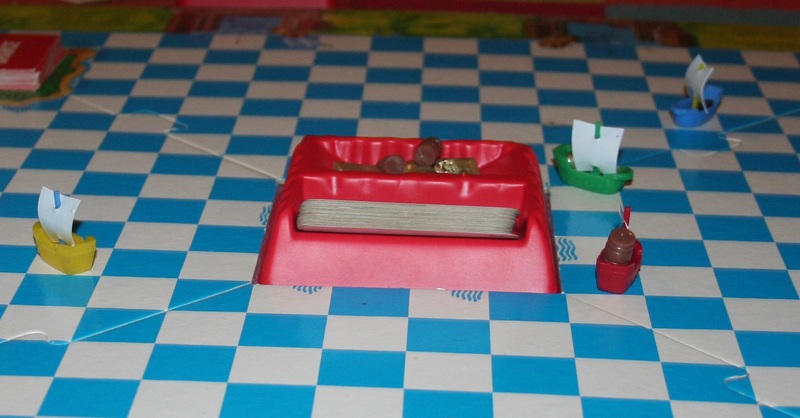 The aim of the game (apart from to sail around the board pretending to be a pirate) is to collect treasure, and, like any fearless Buccaneer roaming the Caribbean, you’re going to use any means available to get it, this could mean trading with a port, attacking a fellow pirate who you see as competition for the limited amount of treasure available or getting random events from the deck of cards located at the Isla de Muerta. To win the game you must be the first player to have a total of 20 treasure points stored in your port. 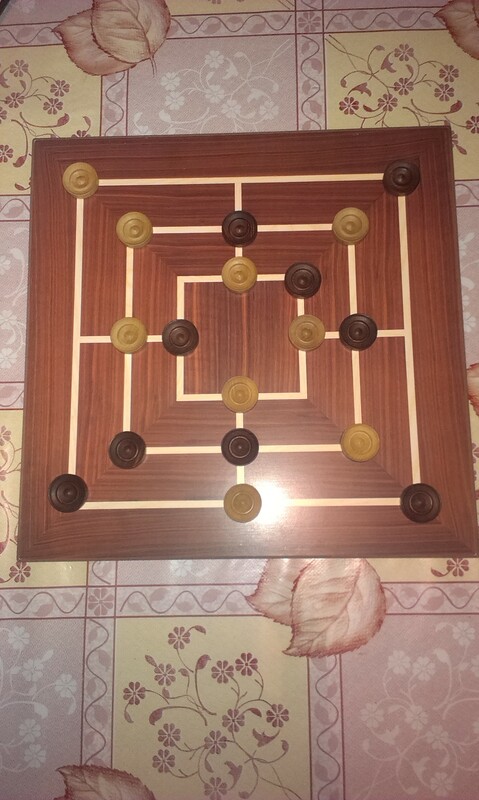 This sounds like a simple objective, but your luck, and the other players, can make it very challenging! At the start of the game each player is dealt five crew cards, these each have a value on them and come in two colours; red and black. To move you take the total value of your crew cards (irrespective of their colour) and can move that many squares in the direction you’re facing. The colour of the cards only matters when you either attack another player, or are attacked. Then you must take the two totals separately. You subtract the smaller total from the larger, and the number you’re left with is your fighting strength. 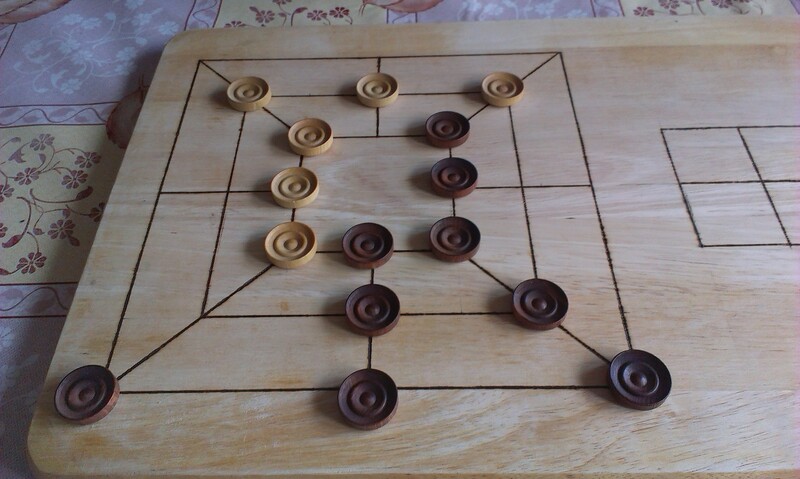 Then the player with the highest number wins the fight. He or she can then take up to two treasure tokens or two crew cards from the loser’s ship. Taking the crew cards away reduces the amount that player can move on their turn as well as decreasing their fight value. Any unclaimed treasure tokens go to the Isla Cruces. The loser must now immediately move in a straight line away from their attacker for as many spaces as their crew cards allow. In the event that a player loses all their crew cards, they can only move one square per turn. 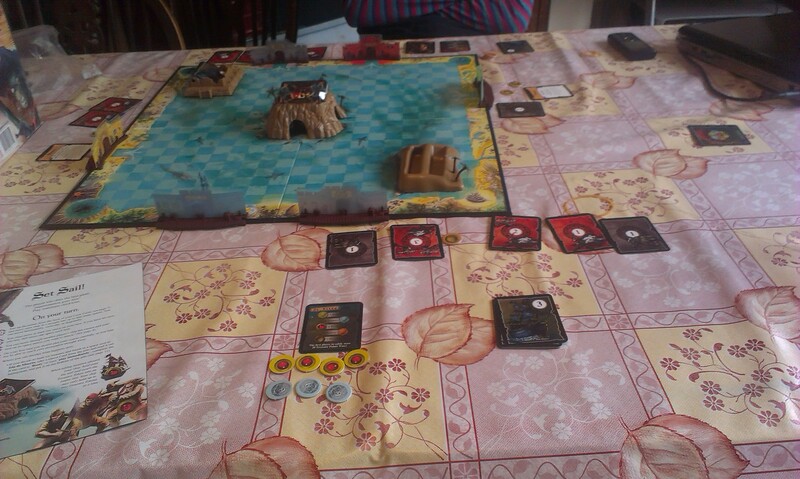 If you want to shake up the game a little by not attacking someone or roaming around from port to port you can sail to the Isla de Muerta, or Treasure Island, in the center for the board. Here you take a chance card from the deck on the island, and read it out. These can be both good and bad, sometimes they simply tell you to dig for treasure, other times they’re quests that can be something you must do immediately, or something that you can do at any point in subsequent turns. They can also simply be bad luck for you and your ship, they might tell you that you got caught in a storm and lost some of your crew, or treasure, or have to miss a turn. All of these are unfortunate for you, and probably make your opponent(s) very happy. These cards make the game more interesting because they’re always a gamble, they help to keep the players on their toes a bit. When you visit a place on a quest card, such as Davey Jones’ Locker, without the quest card, nothing happens, these places are irrelevant unless you have a quest card that tells you to go there for whatever reason. In comparison to the original a HUGE flaw in this version of the game is its canceled down rules, while it means you can play faster and don’t feel like you’ve just read a novel after reading the instructions it leaves you very unclear on some points. Meaning that when certain circumstances occur you have to make a decision as to what happens in this case, leading to a face off because one option will probably benefit one player more then the others and vice versa. Now having played the original (but not for a long time) I remember the original instructions being far less vague, however I can not specifically make comparisons as I haven’t read the original instructions in two years or so. However, the biggest flaw in this game is the storage! The game comes just in a box, with no vacuum formed plastic tray shaped to fit all the pieces (which is basically a given with 99% of board games). 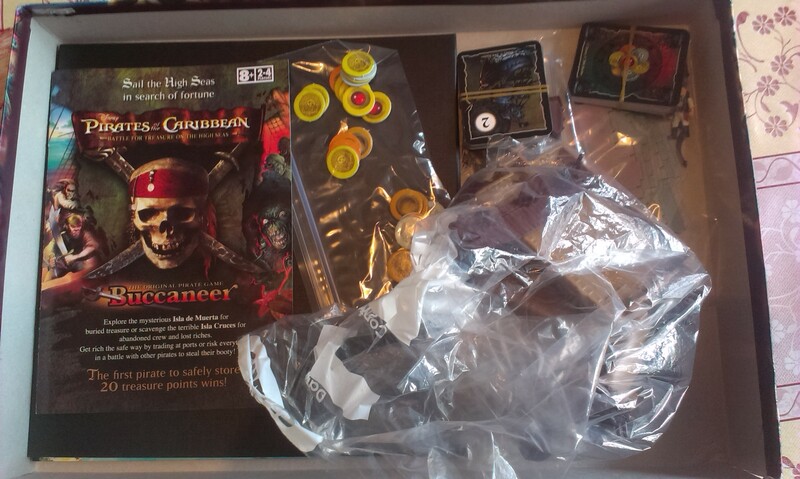 This is the game in its box, the bags and rubber bands are not even included. I stole them from the kitchen to keep the pieces and cards together! 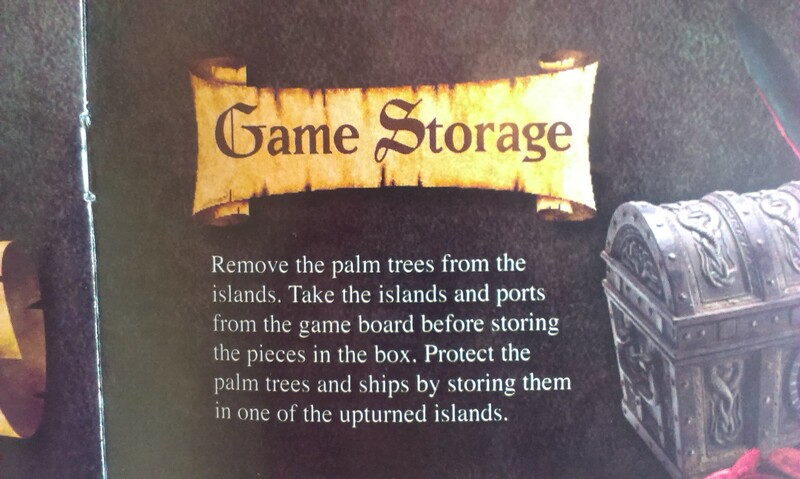 This is in the instructions as some sort of compensation for the lack of any actual storage system. Now, while all the separate pieces for the board are awesome, there are a lot of bits when all’s said and done and just to have them in the upturned islands inside the box is fine…SO LONG AS YOU PLAN ON NEVER MOVING THE BOX! Or taking it to a friend house…Or anything…EVER! I can’t imagine it would be that expensive to have produced a plastic insert for the box to hold the pieces…Would it? The last thing I have a problem with, with this version of the game, is that in the original game you got awesome little pieces of treasure! If you can see in this picture there’s a barrel in the ship and treasure pieces in the island. But in this version you just get little tokens that represent the treasure! As you can see at the bottom of this picture the sets of tokens representing ruby’s and silver. However I will let this go as to counter it, they changed the middle section to you have to actually dig for the treasure with you finger so you don’t know what your going to get which makes the game much more interesting.